This past Saturday, we made the drive to Olbrich Gardens in Madison as part of the weekend walking tour. The botanical garden was born in 1952, named after Michael Olbrich, who purchased and donated 3,500 feet of Lake Monona shoreline to the City of Madison in 1921. We had not been to the gardens since our dear father was alive, probably ten years or more, so it was time. The day was hot and humid, but we both found pleasure walking in the shaded areas and finding late summer color among the flowers (we knew there would be a thirst-quenching beer later). 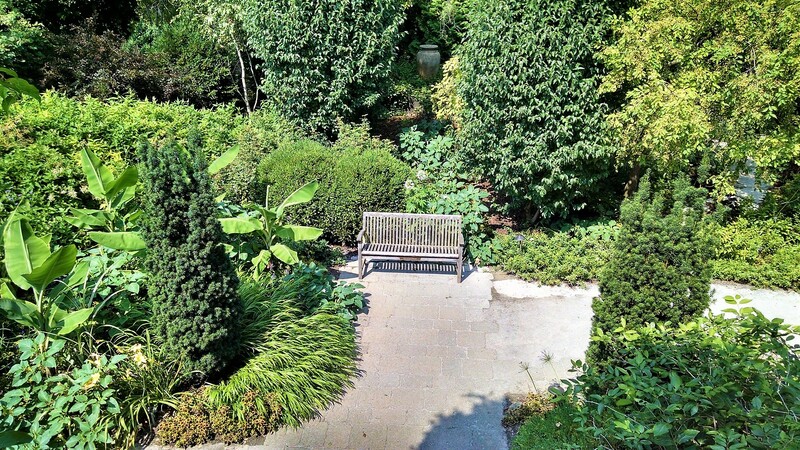 I was extremely enamored with the benches that were placed in many areas of the garden – among the flowers, along the paths, holding court for brick and mortar. So pretty! I love to sit on benches and stare into space or contemplate what is not lost. It was a bit too warm on Saturday to sit for too long, but I can look at these photos now, in the cool of the A/C, and find unfathomed peace. I should have counted the benches. There were many more than what’s in this post. Who can resist sitting here? This little guy was hiding in the greenery. Colors of the Thai garden. I called this the “dog days” pond. I really don’t know…the concrete ball tree?? The combination of purple and orange has always been one of my favorites. The addition of Mr. black and yellow bee added a nice touch. This post has been brought to you by benches, a bee and concrete balls. 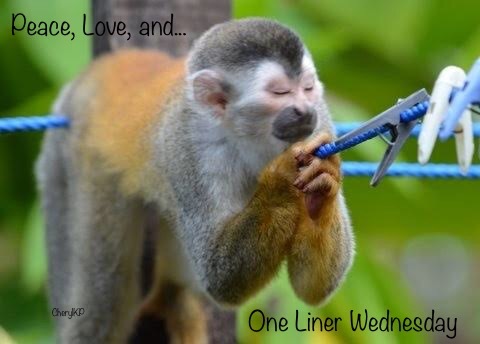 If you are wondering what “One-Liner Wednesday is all about, CLICK HERE. Beautiful photos and what a nice visit you shared with your brother. My youngest lives in Middleton and she has been to that garden, she loves it there, too. I’m glad you shared pictures, I can now see why it is a hot spot to visit! There are plenty of places to find beer! Happy Wednesday! Happy Wednesday, Shelley! This would be a wonderful place to visit in the fall or on a cooler day. They have some very unique events during the year that makes me wish I lived a little closer! Thanks for bringing us along, Mary. Those benches do look inviting. I’m reminded of my dad. When he took us to the amusement park, he said he liked to “ride the bench” while we rode everything else. I hope the beer made up for the heat of the day. You’re welcome, Dan. I like your dad’s expression of “riding the bench.” Funny! We had a beer before the heated walk and then one later at supper time. In between…lots and lots and lots of water! Love this post and its beautiful pictures! I like the looks of the fountain in the English Garden and I’m fascinated by the lights in the tree canopy. I bet it is gorgeous at night when they are turned on. I was thinking the same thing about the lights. And I’m curious about a fall evening event when they light fire pits around the garden. I think that would be relaxing and very cool. Nice pictures. I liked Dog Days Pond. Thanks Frank. One of the kids that came through thought the green pond was gross. I thought it was pretty in a green sort of way. Ooh! I love the photos of the benches and their views! What a nice combination for your post. It’s a wonderful garden, one I’ll have to visit again when it’s not so hot. So I can sit on the benches for longer than a minute. I spend my breaks in the shade, usually observing critters. It’s almost as good as a margar — No, not it’s not 😛 But it’s nice! The Olbrich Gardens thank you! We have family friends in Appleton. One of their kids lives in Madison. Maybe we make a trip up that way one day. Pretty gardens. On a hot summer day, I would love a bench underneath that canopy of trees. I imagine that at night with those small lights, it would be a pretty place to sit.